Strings will be the thing as Lakeland College opens its 2013-14 Krueger Fine Arts Series on Friday, Sept. 27. Black Violin – the wildly popular group that had students buzzing in 2010 – returns to the Bradley Theatre stage, along with special guest The Moxie Strings. The show begins at 7:30 p.m. with The Moxie Strings. Tickets are $15 for adults and $5 for non-Lakeland students, and can be purchased in advance by contacting Deb Fale at 920-565-1536 or at the door. Black Violin played to a packed Bradley Theatre in the fall of 2010. The duo of Wilner "Wil B" Baptiste and Kevin "Kev Marcus" Sylvester combines the eloquence and proficiency of classical orchestra strings, and forges it with the vibes and smooth flows of hip-hop. Black Violin creates a sound that is refreshing and uplifting to hip-hop lovers and classical string enthusiasts. Their ability to blend the two genres flawlessly promises an evening that everyone is guaranteed to feel. A review in the New York Times said, "Black Violin works hard, but makes it all look like play…Sometimes they play with the intense seriousness of orchestral soloists; at others they fiddle as if at a hoedown; at still others they strum the violin and viola like guitars." Black Violin has worked alongside many talented artists and groups, including Linkin Park, Akon and Wu-Tang Clan. The smooth duo has also collaborated with the likes of P. Diddy, Kanye West, 50 Cent, Tom Petty, Aerosmith and many more. 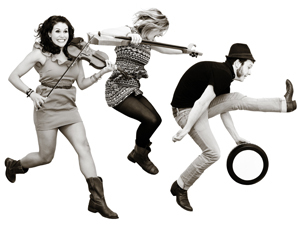 The Moxie Strings is a fun, energetic crew that delivers a large dose of feel good. Between their upbeat string style and their natural on-stage charisma, the group gives a new spin to bluegrass, Celtic, Canadian, rock, jazz and old time through a young perspective that is rooted in tradition. The Moxie Strings brings a unique bravura fashioned by the electrifying combination of fiddle player Diana Ladio and electric cellist Alison Lynn. The duo is joined on stage by world percussionist Fritz McGirr, who adds a dynamic sound with his creative rhythmic energy. Away from the stage, the group travels the country jumping from classroom to classroom to spend time introducing new genres of music to beginning high school and middle school string students. The group will be giving a free workshop to Lakeland music students and area school music students earlier in the day. The Moxie Strings was also honored as the featured artists/clinicians for MSBOA's first annual Alternative Styles Day. Learn more about the two groups online at blackviolin.net and themoxiestrings.com. The lecture will begin at 11:15 a.m. at Lakeland’s Bradley Theater. Admission is free and open to the public. Petri will use historical contexts, debates and present-day issues to discuss how trends have affected the Constitution, and the way the document has been interpreted over the past two decades. He will also offer insight on how he personally uses the Constitution to guide him in his decisions in Congress. Petri represents Wisconsin's 6th Congressional District and is serving his 18th term in the U.S. House of Representatives. 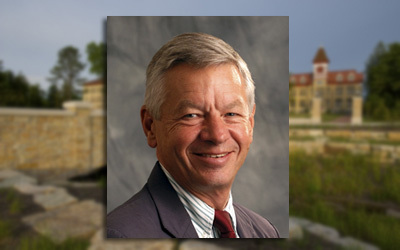 First elected in April 1979, Petri has been returned to office every two years since. He is a current member of both the Transportation and Infrastructure Committee and the Committee on Education and the Workforce (formerly Education and Labor). As a member of the Committee on Education and the Workforce, he is a member of the Subcommittee on Higher Education and Workforce Training. Petri is no stranger to Lakeland. In 2002, he delivered the commencement address and was awarded an honorary doctor of laws degree. Petri also visited the college in 2010 as a part of a greater area tour he organized for Japanese Ambassador Ichiro Fujisaki, who spoke about the value of Lakeland’s Japan campus. Lakeland College's main campus is buzzing as classes for the 2013-14 academic started on August 26. New students move to campus on August 22, and the college's 10 residence halls are once filled with activity. The campus welcomed approximately 310 new students and the semester started with approximately 885 total students in the traditional campus program. In addition to the new students, Lakeland welcomes several new faculty members this year as the college grows some of its most popular majors. Five faculty will begin teaching this fall in new positions, and four new faculty are filling positions left open due to faculty retirements or departures. The academic year will formally begin with the opening convocation on Thursday, August 29. 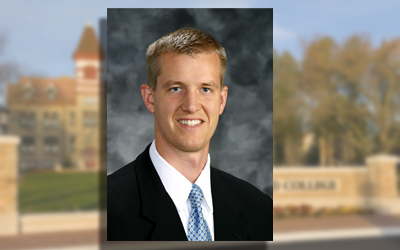 Wisconsin State Assemblyman Dale Kooyenga, a 2000 Lakeland graduate, will deliver the featured address at the annual event, which begins at 11 a.m. in the Bradley Theater. New students were introduced Friday to a Lakeland tradition - the college's fifth annual "Building Bridges, Building Community" event, which gives new students an opportunity to meet and work with one another in a large-scale service effort that benefits several local organizations. After a few hours of work, the groups met at Firemen's Park in Elkhart Lake for a cookout and celebration. 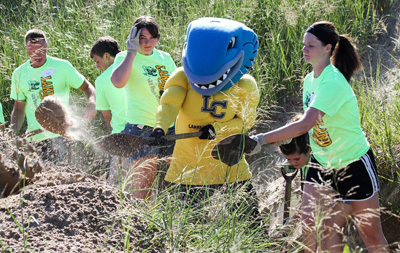 "This was great, great for Lakeland College, the students and the community," said Josh Hill, a new Lakeland student from Schoolcraft, Mich. "It shows how much our school cares, and how Lakeland educates us in different ways. Most of us choose Lakeland because we know it's such a tight-knight community, and this is just one of many examples of that." Throughout life's journey, the choices people make determine the content for their life book. Dale Kooyenga, a 2000 Lakeland College graduate currently serving in the Wisconsin State Assembly, asked Lakeland students to examine the contents of their life book during Lakeland's opening convocation, the formal kickoff to the 2013-14 academic year. Kooyenga, who graduated from Lakeland with a bachelor's degree in accounting, has contributed plenty of positives to his life book since graduating. In addition to his current role as an elected official, he worked as an accountant at KPMG, one of the Big Four accounting firms, and served in the U.S. Army in Iraq/Afghanistan. Kooyenga reflected on his time in college while addressing a packed Bradley Theatre. He said the skills he learned have led him down a path of career success. He encouraged students to be ready to adjust to life's curves. "There are life experiences that will change your main plan in life, so you need to learn to be flexible and open to change," he said. Life also requires tough decisions, and Kooyenga suggested students know how to take the right approach and understand what motivates their decisions. That will allow you to write a compelling life book that will be source of pride. "My main goal in life is, someday when my grandkids sit down and read my book, I want them to be able to put that book down and say, ‘Wow that was a very good book,'" Kooyenga said. "'There were some ups and downs, and he made a lot of mistakes, but he fought for what he thought was right, and he fought with a passion.'" Kooyenga concluded with three pieces of advice: Be there for your loved ones, remember that everyone has something to teach you and to treasure your personal integrity and relationships over material things. Much of this advice, Kooyenga said, came from his father, who worked as a garbage man. "The biggest thing to the people that love you is for you to just show up and be present," Kooyenga said. "All that truly matters is your integrity, and the relationships you have." Students also heard from Lakeland Interim President Dan Eck, who delivered the charge for the academic year. He urged students to take care of themselves, take care of each other and take care of the campus. Lakeland College has freshened up its business administration major with changes that will better position graduates to enter the workforce. The college consulted with recent alumni in the workforce, employers and advisory boards for these programs in making these changes. Analysis of career development data and national market trends were also part of the process. Students majoring in business administration will select one (or more) of eight emphasis areas to complement their studies. The emphasis areas are between 12-18 credits and provide greater focus in select areas. 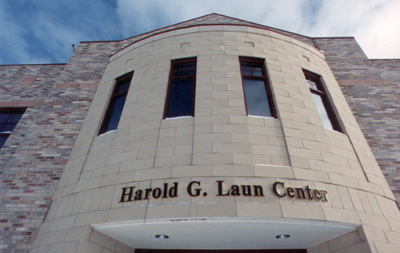 The major is available through Lakeland’s traditional program at its main campus and the college’s evening, weekend and online program offered at seven locations throughout Wisconsin. The emphasis areas are business economics, finance and insurance, healthcare management, nonprofit management, sport management, management, hospitality management and international business. Finance and insurance is a new area for Lakeland and includes three new courses which cover concepts that are part of national competencies required to work in the industry. The non-profit organization management and sport management emphasis areas will provide access to classes within those existing programs at Lakeland for business students interested in those areas. “Lakeland College is agile enough to innovate on behalf of students to create a unique environment as students search for a profession and security in jobs,” said Mike Ansay, chairman and chief executive officer at Ansay & Associates LLC, one of the region’s largest and fasting-growing insurance agencies. According to the 2013 National Association of Colleges & Employers Job Outlook Survey, finance is the No. 1 major nationally in terms of job openings, and the insurance industry is a major employer in Wisconsin. Converting a capstone leadership course to a business policy and strategy course, based on feedback from employers who said these are skills they seek in applicants. Reducing the number of credits required for several majors in the business division to allow students more choices in elective courses within and outside the division. Changing the resort management major to hospitality management, which reflects hiring and other marketplace trends in the industry. This major is only available through the main campus program. A requirement that students in the international business major or the emphasis area complete a study abroad experience. This major is only available through the main campus program. Koehler Award Winner - Who Will It Be?